So here we have the reviews of the whole of series 2, which sadly is the only series of 'DOOMWATCH' that all the episodes survived. Toby Wren's death throws the team into disarray and plagues Quist. Meanwhile Ridge investigates genetic experiments. Unfortunately the last episode of series 1 is considered a 'missing episode' but what we do know is that Robert Powell's character Toby Wren was trying to defuse a bomb on a pier which unfortunately goes off and kills him in the process. We know this as we see at the very beginning of the first episode of series 2 what happened and the consequent fallout from that accident. What results is an episode with Dr. Quist (John Paul) being investigated by tribunal over his actions of the death of Toby Wren and two others when the bomb went off and whether he should stay in charge of 'DOOMWATCH'. We also see Dr. John ridge (Simon Oates) upset by his former partner Toby Wren's death, investigating a scientist who has tampered with genetics and has created a animal-human hybrid, which we get to see and is done rather well. We also get introduced to two new characters Geoffrey Hardcastle (John Nolan) and Barbara Mason (Vivien Sherrard) as the new receptionist, who takes over from Pat Hunnisett (Wendy Hall). The episode ends with Dr. Quist keeping his job as the head of 'DOOMWATCH'. 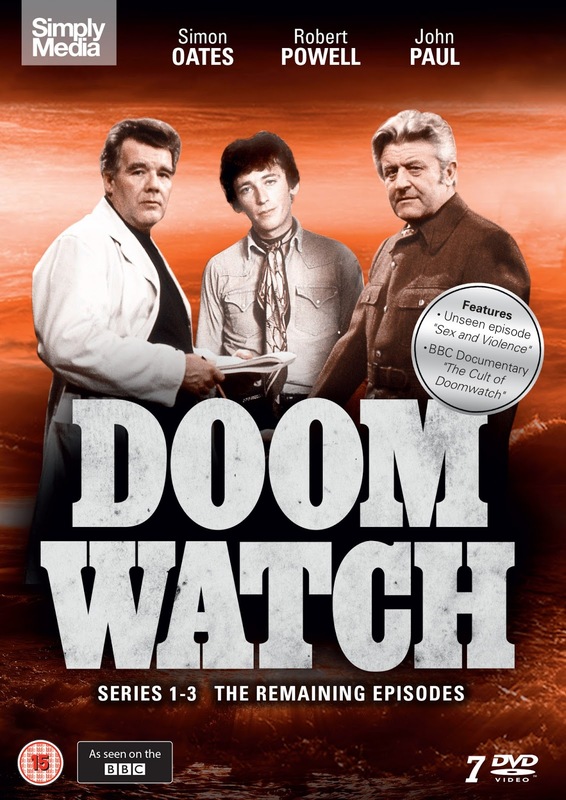 'DOOMWATCH' investigates the disappearance of two cavers amidst strange circumstances and discovers the taint of biological warfare in Yorkshire. 'INVASION' starts off with Dr. Ridge and Hardcastle sending two local boys down a cave to get water samples but when those two boys don't return they investigate and find there is more then just the missing boys to worry about. In a local building away from the village there is a biological weapon that has been kept secret and the government will do anything they can to keep it quiet. Unfortunately when the two boys do return to the village, Dr. Quist and the team soon find out the boys had gotten into the contaminated building and are infected and now the whole village is contaminated. A story of people messing with things they shouldn't, be that the boys or the government themselves who tried but failed to contain their weapon. The episode ends with all the villagers now decontaminated having to leave the village and possibly never return to the place they call home. A small British protectorate is evacuated following a series of tremors. However the residents don't want to leave their home. After a investigation into genetics by the 'DOOMWATCH' team on the residents of a small island causes uproar amongst the natives, the team try to make life easier for them. Unfortunately the government have plans for the island the residents once lived on and now the former residents must decide whether they go back to their island or stay living in England. They are also made aware that the water and the island itself is polluted making the residents sick and could cause them more harm if they go back. The former islanders decide that wherever they go there is pollution and if they are going to die they would rather die on their own island. Dr. Quist unwilling lets them go back after they vote but did the islanders make the right choice? Past mistakes or accidents can cause extreme pain to others in the future, in this case it is pollution and no matter how much we try to protect ourselves from the danger, we will always be caught in the end. 'DOOMWATCH' investigates when the 'wonder drug' stellamycin is implicated in the deaths of several children. On the face of things this episode deals with an epidemic of typhoid amongst children and after one dies the team must investigate how the typhoid outbreak started and is the wonder drug stellamycin safe to use at all. We all know that with the introduction of antibiotics mankind can now live longer and this has caused a rise in the human population but how far will it go, a cure for everything where nobody dies? In 'NO ROOM FOR ERROR' it is shown that sometimes we are best to leave things alone especially when it comes to the health of people. It is also interesting to note that this episode introduces Dr. Fay Chantry (played by Jean Trend) as a possible new member of the team, whether this is because viewers had noted that the team was male dominated in the first series and they wanted a female perspective on matters is another story altogether. A 17-year old boy is expelled from school because of his genes. Can people be labelled for life by science? This is a case of people being judged before it is proven they maybe guilty. In this episode a doctor believes that people with the XYY chromosome are more likely to be violent or commit crimes, so to try and capture those who maybe future criminals he takes blood from children at a school and tests it. One boy is found to to have the extra chromosome and is expelled after a science experiment blows up in someones face. This of course is proof for that doctor and the boy believes he is a bad person, to the point he stands on a runaway hoping to get killed. Do our genes make us who we are or do we become our own person by nature? A question which will always be asked and this episode shows the possible outcome if we don't fully understand the results. A hospital introduces a new electronic monitoring system for its patients - but is the machine failing? Man vs. Machine. No this isn't 'TERMINATOR' this is something which could in fact happen a lot sooner then that. Doctors relying on machines to make the judgement calls of whether to give a patient medicine or not will lead to some patients dying due to the machine. Would these patients have lived if they were seen by a human being? That is unknown, but it shows that we do rely on computers far too much to make the right decision, even one as detrimental as someones life. A cautionary tale of things to come for sure. Dr. Quist is late for an important meeting with the Prime Minister. When he arrives, he slurs his words and appears completely drunk. America is looking at possibly starting its very own 'DOOMWATCH' and so invites Dr. Quist to attend a conference to speak about this matter and others. But when he returns back in England to speak to the Prime Minister he is not himself at all and comes across as drunk. So the minister himself goes back to America in his place to do the conference but just like Dr. Quist he isn't himself. We discover a man named Ainslie is brainwashing people that are to do with 'DOOMWATCH' to make them look incompetent and thus end 'DOOMWATCH' in England and not have it happen in America at all. A slow paced episode but works well, especially with the character of Ainslie leading the way as the brainwasher. Look out for Desmond Llewelyn (Q from many James Bond films) as Thompson. The Scilly Isles are quarantined following an outbreak of yellow fever. Doomwatch's investigations point towards an arachnid source. After a person at a health farm gets taken down by suspected yellow fever the health farm and the island itself is put into quarantine, leaving the minister of health stuck on the island for a week. Is it really yellow fever? All the symptoms point to it but what if it something else? We find out it is something else indeed as a scientist has been creating a virus that kills off a certain moth but in turn the moth is eaten by spiders which then mutates the virus making it even deadlier then first devised. 'DOOMWATCH' are there purely for another reason but get called to help by the minister of health. Another case of man hoping to make things better for mankind but ultimately creating a monster in the form of a killer virus. A swimmer off the Scottish coast encounters deadly pollution, but the investigation uncovers something far stranger when it is linked to an old friend of Dr. Quist. A man goes swimming off the coast of Scotland and ends up swimming in a pool of mustard gas resulting in his death. 'DOOMWATCH' is called in to investigate but in doing so they find that the ship that was carrying the mustard gas sank many years ago with its cargo. Now they must find the man who captained that vessel and find out its whereabouts before someone else dies. When they find the man known as Mcarthur, played by Patrick Troughton (Doctor Who, The Omen (1976) ) he is more machine then man. He believes that he is the ultimate being as he is more mind then body and can spend forever thinking, but at what cost? This is very much a man wanting to live forever type episode, but in Mcarthur's case he is not living as he needs someone to check over the machines to make sure he carries on living. Is this a life you may ask or is it just prolonging the inevitable? Dr. Fay Chantry performs a biological study of tower block life - and find far more than she expected. Isolation, depression and eventually death. A study of life in a tower block building reveals that all of these things are possible. So what starts as a simple job turns detrimental to Dr. Chantry's emotional state. The study also looks at whether people in these sorts of environments are more likely to be violent or be a nuisance to the public. An interesting episode that seems even more relevant to today's world. An inquest is launched into a child's death from rabies. Was a nearby laboratory the source of the virus? A little girl from a village is killed by rabies but what is the cause? A local woman in the village believes it to be the direct result of lab testing on flies and they escaped and bit the girl. Following an inquest in the local pub (due to space) we discover that the lab was indeed testing on flies with the rabies virus, but it is revealed that the cause of the rabies is not the flies but the original experiment with dogs that have been let go freely. One of those dogs bit the girl who died and another boy who has been looking after the dogs has also been bitten and may also have rabies. 'DOOMWATCH' investigations have revealed the cause and now they must get the boy to hospital before it is too late. Human emotions are pushed to the brink in this episode as people don't want their pets destroyed and don't like to think their pets maybe the cause of the outbreak. It shows how a death due to negligence by others can pull a close knit community closer or rip it apart. A group of teenagers, raised under a new scientific education system, raid a pharmaceuticals company. An elite boarding school is using computers to train the children of tomorrow how to think things through logically but in doing so have possibly created human robots. Due to the schools financial strings being pulled tighter some of the boys form a plan to rob a local pharmaceutical company of a file containing important documentation about a new drug, in doing so they will hold the file ransom until they are paid the sum of £25,000. The company do indeed pay up and get the file back in the end, but the man in charge of the company now has a personal dilemma due to the fact his son was involved in the robbery. This episode is looking at the possibility that a school could in fact make every child the same resulting in unemotional logical thinking children, in a way they are nothing more then robots and can be more dangerous then you would think a child can be. The team investigate a factory that may be poisoning the environment - and may have already claimed the life of a young boy. A company looking to create a new form of metal maybe causing the death of not only the staff, but also the town itself. 'DOOMWATCH' are called into investigate the company after a young boy who was trying to get his ball back dies of some form of lung poisoning. They discover that due to the way this new form of metal is created it releases a deadly chemical into the air which is slowly killing people. So the choices are to put safety measures in place or close. The company itself chooses to close the factory rather then spend the money to fix it, this makes the residents of the town angry and 'DOOMWATCH' become the target. After all why spend money fixing a problem when it is cheaper to just move and start again somewhere else. Dr. Quist at the very end makes a valid point about the government won't foot the bill and neither will the company but if the residents of the town want to have their lifes continue as they are then maybe they should pay. Of course this angers the residents, but he soon goes on a tirade about pollution and if things don't change now then the world as they know it will be gone forever. A cautionary tale of factory pollution and the effects it can have on not just those who work there but the public as well. We can all do our bit to stop pollution but if no one does anything about it we are all doomed. So there we have series 2 of 'DOOMWATCH' reviewed, to read reviews on series 1 click here. Series 3 is available in this boxset also and you can find the review of that series by clicking here.